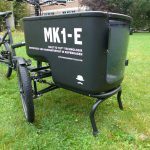 Cargo tricycles are often said to be the safer decision when it comes to a family cargo bike. Yet this subjective plus in safety comes at the price of fun and riding dynamics. 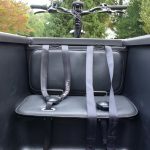 By 2016 quite some cargo bike manufacturers tried to bring the joy of riding a two-wheeler into the “safe” environment of a three wheeled cargo bike. 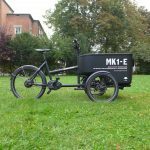 One of those companies who faced the challenges of building a tilting cargo tricycle is Butchers and Bicycles. They might not have been the first ones, but their solution is a very attractive one. 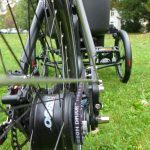 Because of the incredible appeal, I was really eager to ride this bike, and so we did a short hands-on last year. 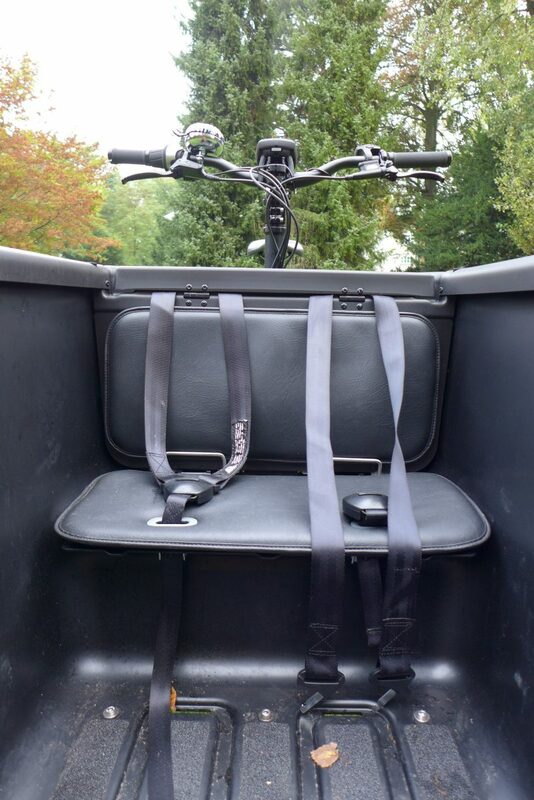 But what is a cargo bike test, if you can only go up and down the street, with no weight in the bike and no kid to carry around? This time, thank’s to the local B’nB dealer, we had the chance to ride it in our daily routine and see the true pros and cons of the bike. The bike we rode was a MK1-E equipped with BOSCH Performance Line middle engine, Gates Carbon Drive, E3 Supernova light set and had the child pack. 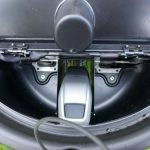 It comes with some slick and stylish fenders and a very practical compartment right in front of the rider. When ordering you can choose between a shiny white and a stealthy matted black. For taking the kids, Butchers and Bicycles offers a roof with sky-view, which is held by an aluminum frame, plugged into the box and able to be taken apart. This pretty much makes a mandatory add-on for families riding on daily bases. 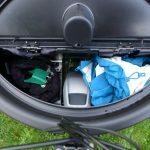 For adding some privacy to your cargo area or if you simply want to keep it dry and clean, there is also a hard cover and a soft cover. The soft “flat cover” is buttoned onto the box and comes handy if you park your bike outside a lot. 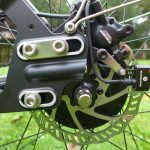 If you are sick of shiftig you can get the e-harmony system, which connects the Nuvinci hub to the engine and takes control of the perfect gear-ratio. This way you always pedal with the cadence you adjust at the “shifter”. The child pack turns the naked box into a cozy place to carry your kids, easy to access through a door in the front. 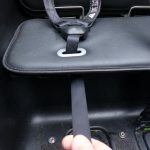 A very nice thing is the Iso-fix mounting for your baby car seat. 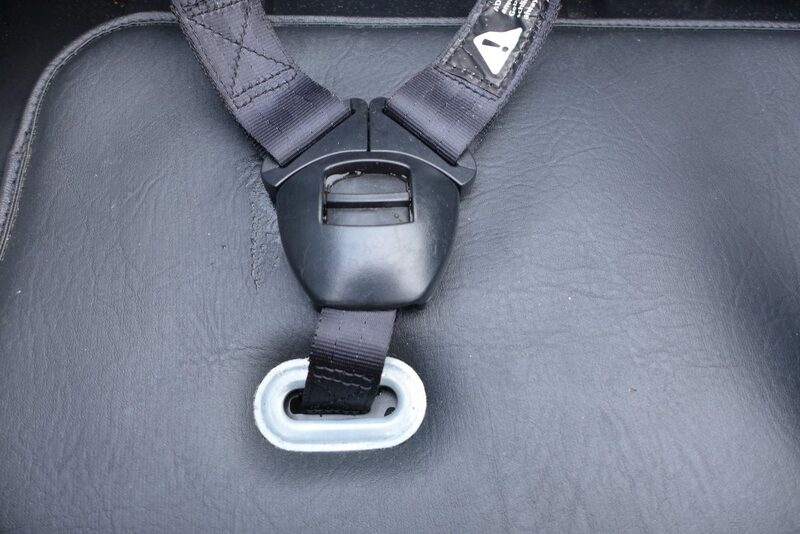 The baby seat is facing backwards, so the baby-eyes are on papa or mama instead of the head-wind. 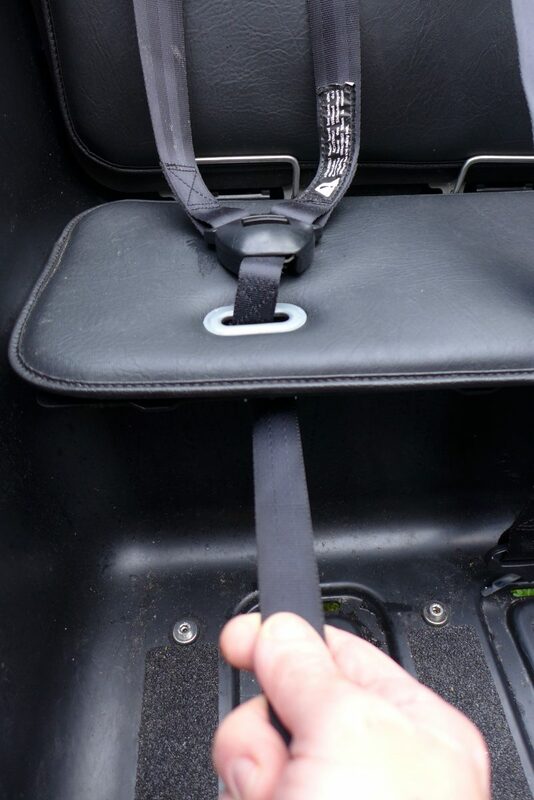 Especially for parents who have a car, this feature comes in handy as you can use the same things you use in your car. The Belts and buckles are good quality and adjusted fine. We tested both extremes the belts’ length can handle: Anouk is 86cm and fit just fine, while the belt was at the very short end of the range. At the same time our big one could still grow a little taller than the 133cm he is measuring right now. All in all a very solid, proven and safe environment to carry your little loves. Only the bench could be a bit more comfortable: when riding on the tough Augsburg cobble stone I heard the smallest tester complaining about the bumps. 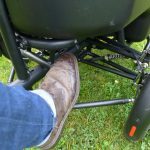 A slightly thicker cushioning could be a comfy improvement as the kids are sitting right on top of the front wheels, were they feel bumps and potholes. Yet the bike rolls on big tires which -ridden with a pressure around 50psi- will offer enough damping abilities. The Bosch Performance Line engine is the perfect choice for the bike as it supports your legs with plenty of torque. 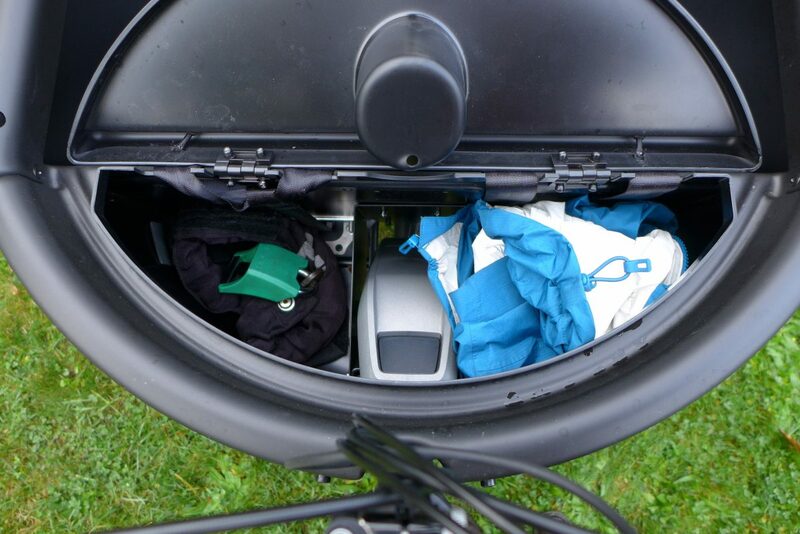 50kg of bike plus rider and cargo want to be accelerated and the engine does that job really good. It runs smoothly and quietly and was very low on nose emission compared to our Bosch Classic. 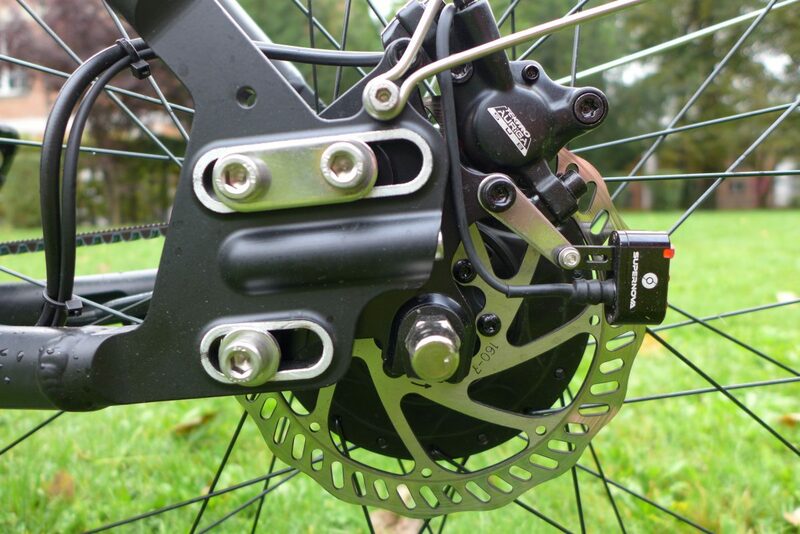 Paired with the Nuvinci 380 Hub this makes a very efficient drivetrain. It won’t make the bike a rocket, but given the weight you are carrying around it is quite a quick ride. It accelerates from zero to cruise in a decent time and is powerful enough to take uphills like it was flat. The Supernova Lights make their statement on the path ahead of you. The V6S headlights, emitting 165lumen each, already rock when you have a single one installed. And the Butchers and Bicycles has two of them. There is a blindspot created by the cargo box, but as you have two of those incredible lights it doesn’t let you sit in the dark when cornering. 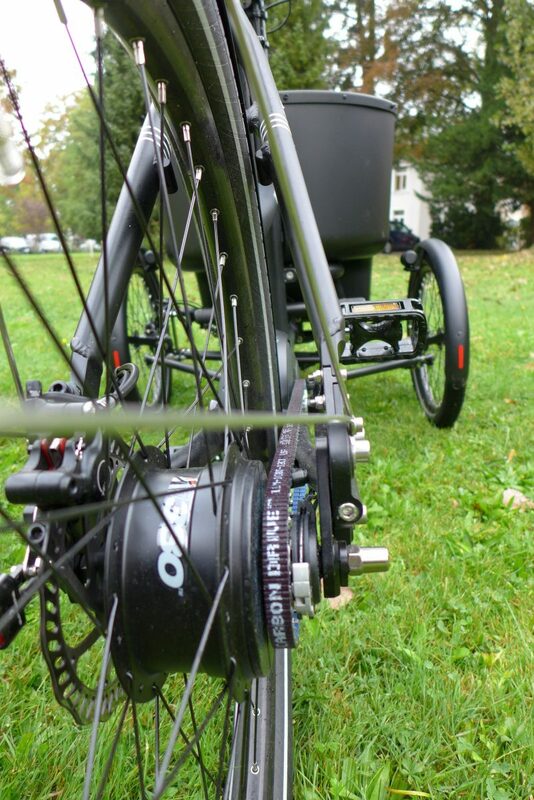 They’re installed so they turn with the front wheels and you will always see where you’re going. Corners are where the MK1 is standing out from the crowd. 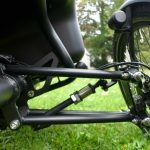 It might not exactly be one of it’s kind anymore, as there are quite some companies working on tilting mechanisms by now. Veleon has done it for some years. UrbanArrow tried it (but dropped the project as it too much of a niche product). HNF-Heisenberg has a very promising bike available by April 2017, but more for professional use than as a family-van. 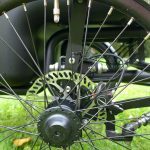 And there is even a bike-addon which converts your regular bike into a tilting tricycle and a lower-budget tilter by Babboe comming up in 2017. 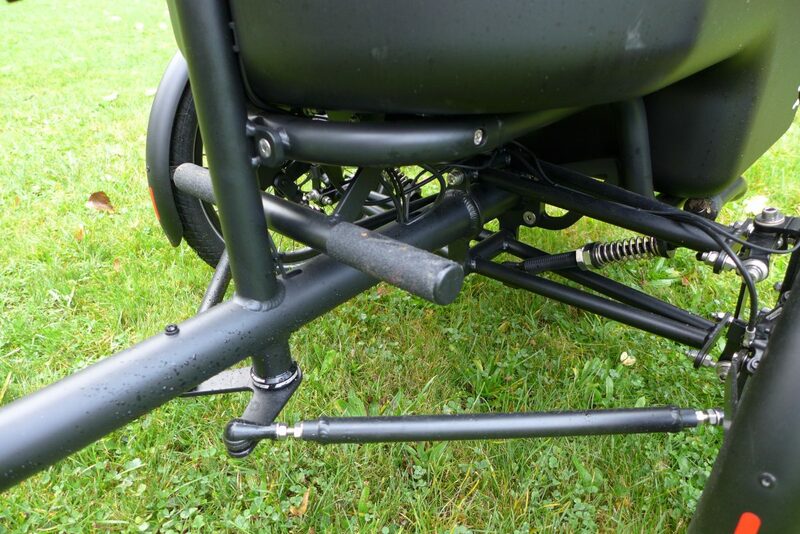 Compared to other trikes the tilting ones promise better handling in corners, as you can lean in. 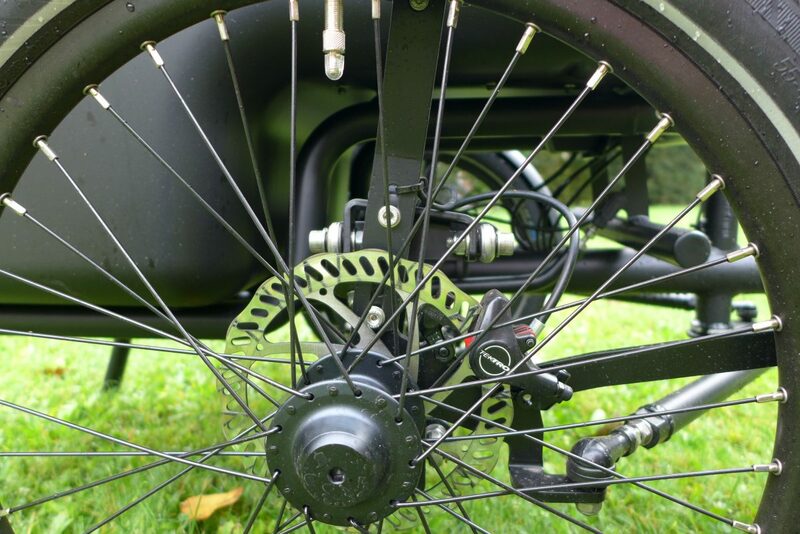 No centrifugal forces will get you off your path – and in worst case off your bike. No risk of flipping over when you go into the corners to fast. Really. I tried hard to prove this point: After some days of getting to know the bike and it’s characteristics I startet to push it. On the third day of riding I explored the limits of it’s physics: The worst case scenario is that the bike will under-steer. In other words, the front wheels will start slipping. But to be fair: I had to try really, really hard to achieve this and it was only in wet conditions, that I managed to get the bike to the limits. 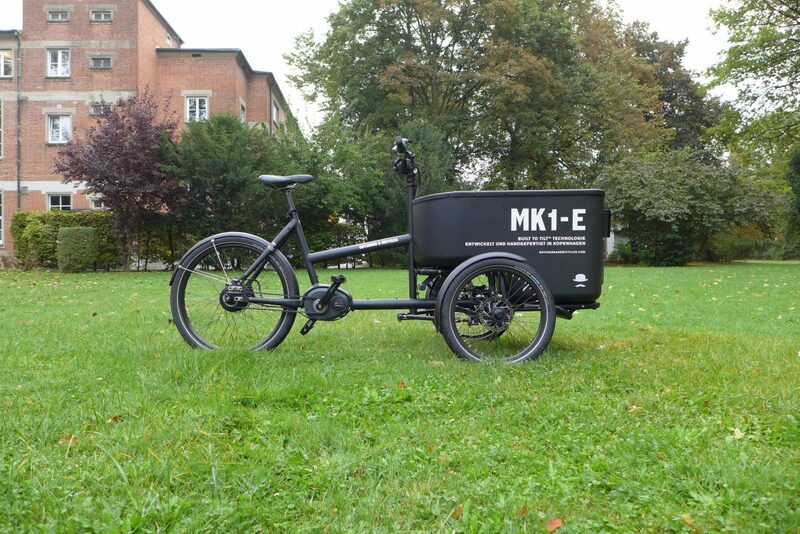 In my opinion the Butchers and Bicycles MK1-E has plenty of reserves, which are very hard to exceed, even in extreme riding situations and at any speed. 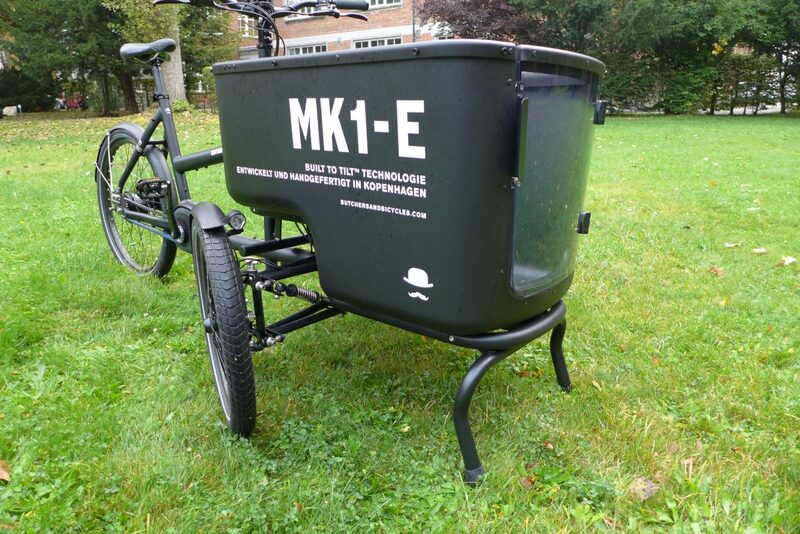 The MK1 is only available in one size. Even though the seat-tube is quite low (500cm should fit from average to tall persons) the length of the frame felt a bit long at first. 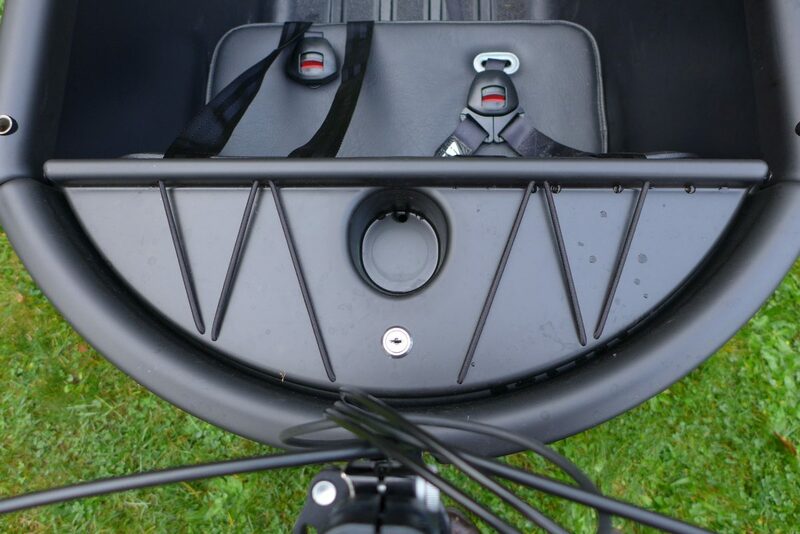 Maybe it is built for tall danish men and women: The top-tube has a length of 660mm and a backwards facing stem with a length of 40mm, making it a sporty posture if you are not so tall. For my body-height of 173cm, I would already suggest replacing the stem with a slightly longer one. When carrying close to maximum load (100kg) inside the box, the bike tends to get a little head-heavy. So when you stop and get off the saddle this might lead to the bike tipping to the front and -as it tilts- most likely also to the side. This is a very unfortunate behavior, which might be able to get handled by some adjustment. 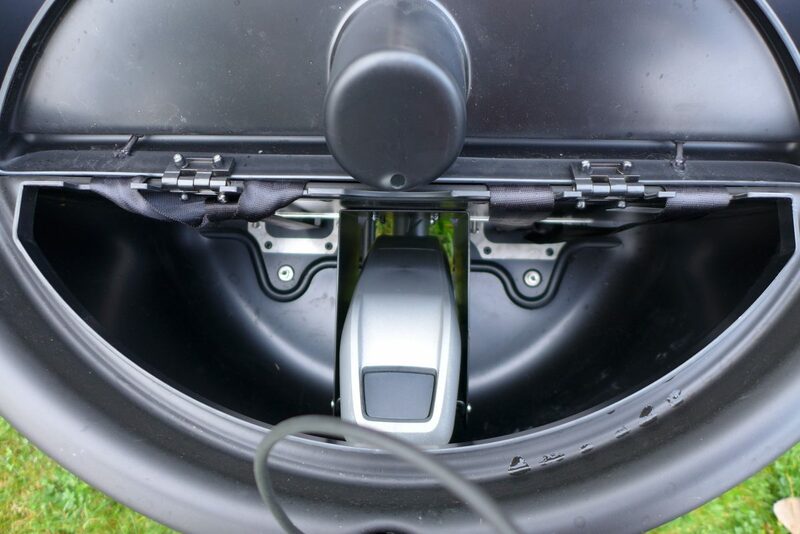 Under the box sit two springs, which support the bikes tilting mechanism to stand upright. 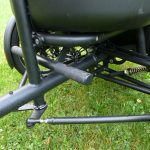 These springs can be adjusted to give more or less support. On the test-bike they were quite soft, so the tilting is easier. 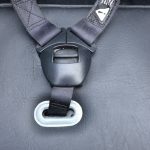 You should definitely take the time to adjust these and find your best compromise between support for your weight, the average weight you are carrying and your liking. This way the only challenge left is the head-heavyness, which comes with a positive flip-slide: you can easily turn the bike on the spot by lifting the rear wheel, which crops the turning-circle of 6m down to zero. Another thing I realized when using the bike fully packed with both kids, a schoolbag and my work-stuff was, that it is really hard to get on the kickstand. Operated by a lever in the back of the box the kickstand lifts the wheels up about an inch. 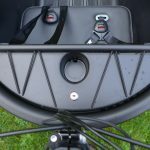 This means you push almost the full weight of your cargo onto the stand. Try this exercise on slippery ground, like wet garage-tiles, and fully loaded box… I would have liked it better, if it was shorter and more like a support that keeps the bike from tilting while being parked on it’s own wheels. 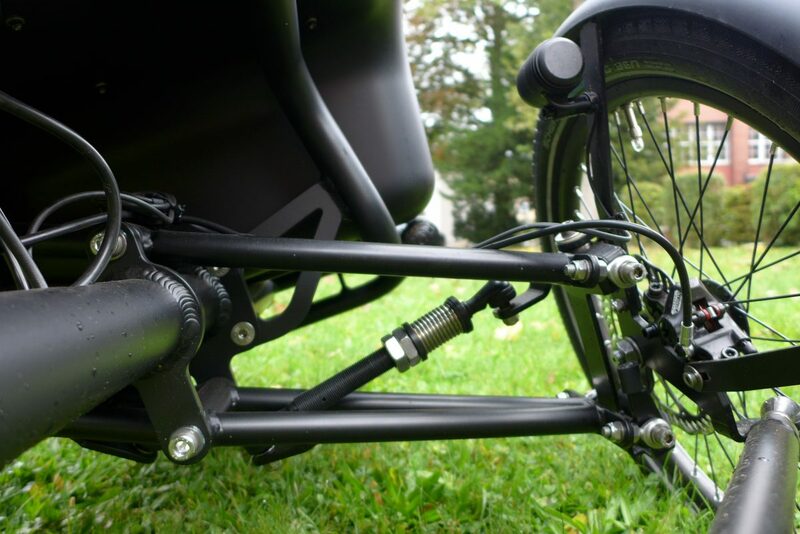 A block used for parking and pushing the trike would ultimately allow the trike to tip over if the user forgets to unblock it before getting in the saddle. And we simply can’t accept that compromise. 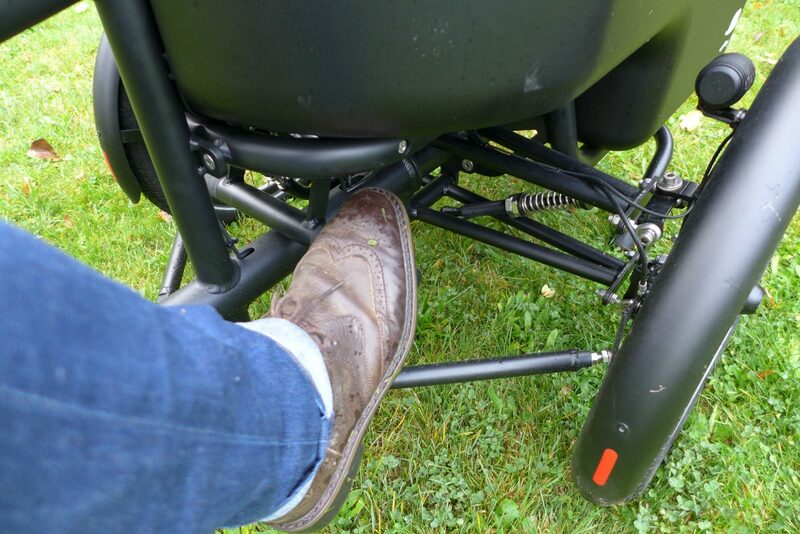 In traffic, you don’t always have enough time to calculate the countermeasures necessary to prevent a non-leaning trike from tipping over, and your body simply reacts according to instinct. 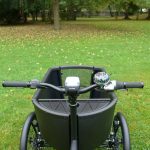 We make a leaning trike that is based on the principles of instinct and laws of physics because we strongly believe this is the best possible solution for families riding with their children or other precious cargo. To me Butchers and Bicycles’ interpretation of a family tricycle is still the trike that has the most wanna-ride-appeal. I personally prefer a sporty ride and could not see me on a regular tricycle: It would definitely have to be a tilting one. And with the clean design, the thought-through features and the high-quality built, the MK1-E is still the benchmark bike when it comes to this niche kind of vehicle. Especially for child transportation I would recommend it is as ride, that will bring roller coaster fun to all passengers at a high level of safety. 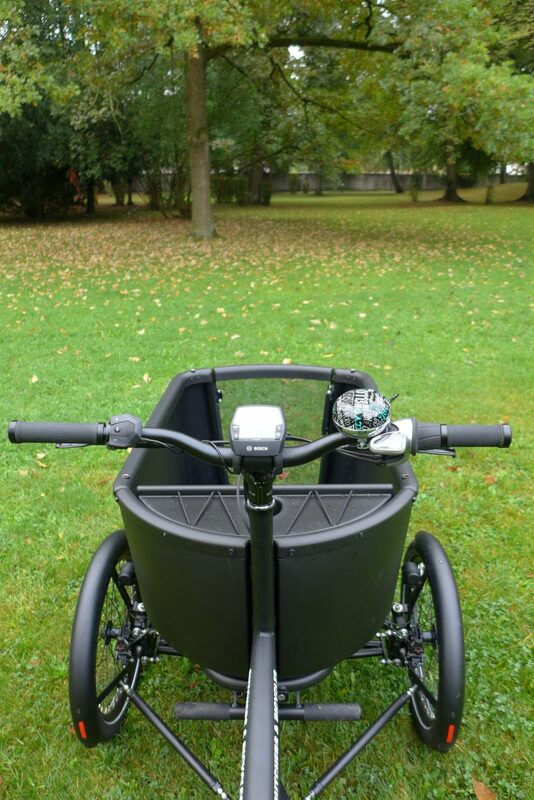 Thank you for this review — we’ve had our MK1-e since May 2018 and ride with our 3.5 and 1.5 year old kids ~5 day a week. We love it. They love it. A complete life changer this summer. The bike takes a day to get used to, then becomes very easy. Hope to see more of these on the road.